With roots in raucous New Orleans street bands, jug band music developed circa 1900 in the urban south (e.g. Louisville, Memphis). The original music was a mix of Memphis blues, ragtime & Appalachian music played on a combination of traditional and makeshift instruments. The bands were street performers, made up of African-American vaudeville and medicine-show musicians. Along with guitars, banjos and mandolins, typical jug-band instruments included washboards, washtub basses, and kazoos. And always a jug. Leaving a little air space while buzzing their lips and half blowing, half humming into a jug’s mouth, players produced distinctive mid and lower-range harmonies. The bands flourished in Memphis, a “wet” oasis in a dry area. Beal Street was “hot.” The best bands had recording contracts. Jug bands played a part in the development of the blues. W. C. Handy learned blues from street musicians. Jimmy Rogers employed jug bands on his recordings, However, in the 1930s, the depression and the devastating effect of radio on record sales brought the original jug-band era to a close. One of the first recordings of the folk era jug band revival was by The Orange Blossom Jug Five, made in 1958 for the poorly-distributed Lyrichord label, “Skiffle in Stereo.” It was also the first recording by New York folksinger Dave Van Ronk, who would revisit the genre in 1964 with the album “Dave Van Ronk and the Ragtime Jug Stompers,” a modern classic and his ragtime guitar picking and repertoire influenced many subsequent jug bands. Gus Cannon’s “Walk Right In” was a #1 hit for The Rooftop Singers in 1963, the only time a jug band song topped the charts. These one-hit wonders even made an appearance at that year’s Newport Folk Festival before fading into obscurity. This brief flurry of interest in the genre sparked the formation of a few jug bands that reached national prominence. 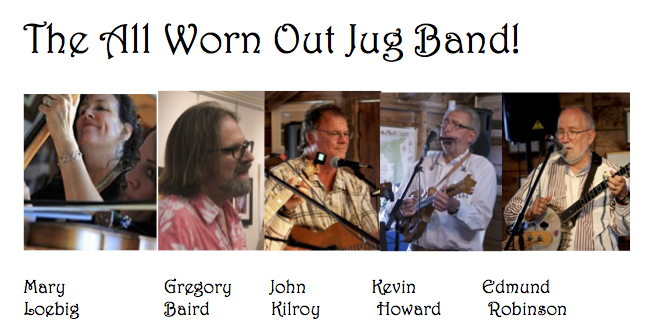 The Jim Kweskin Jug Band of Boston/Cambridge, featured the washtub bass and jug player Fritz Richmond, who later played jug on Warren Zevon’s “I’ll Sleep When I’m Dead.” The New York based Even Dozen Jug Band featured (among others) Maria D’Amato, Joshua Rifkin, David Grisman, Stefan Grossman, John Sebastian, and Steve Katz. Maria D’Amato then joined The Jim Kweskin Jug Band, later marrying guitarist Geoff Muldaur. John Sebastian founded the pop music group The Lovin’ Spoonful and later continued as a successful solo artist. Katz was an original member of the Blues Project, which evolved into Blood, Sweat, and Tears. Country Joe and the Fish came from The Instant Action Jug Band. Mungo Jerry, who had evolved from an earlier blues group Good Earth, were, in effect a jug band. Jesse Colin Young moved to the west coast and formed The Youngbloods, whose first hit was “Grizzly Bear,” a jug band standard. Another group with jug band roots was the Grateful Dead. Jerry Garcia, Bob Weir, and Ron “Pigpen” McKernan were in Mother McCree’s Uptown Jug Champions before forming The Warlocks, which evolved into the Grateful Dead. A self-titled CD of Mother McCree’s jug band music recorded in 1964 was released in 1999. Maria Muldaur, Geoff Muldaur, David Grisman, and Stefan Grossman all continued with successful solo careers. Pop-rock tributes to jug band music include “Willie and the Poor Boys” by Creedence Clearwater Revival and “Jug Band Music” by The Lovin’ Spoonful. The Spoonful also mined the old songs. In addition to doing versions of songs from the classic jug band repertoire on their first album “Do You Believe In Magic” (1965) such as “Blues In The Bottle,” “Sportin’ Life,” “My Gal,” “Fishin’ Blues,” and “Wild About My Lovin’,” Sebastian’s “Younger Girl” used the melody of Gus Cannon’s “Prison Wall Blues.” Indeed, the song “Do You Believe In Magic,” a Top Ten hit, mentioned the genre in its lyrics: “If you believe in magic, don’t bother to choose / If it’s jug band music or rhythm and blues / Just go and listen, it’ll start with a smile / That won’t wipe off your face no matter how hard you try.” That instantaneous joy many have felt upon first listening to jug band music contributes to its fans’ long lasting affection and the genre’s longevity. While we tune and change instruments between songs, and sometimes when we least expect it, variously inspired bandmates regale us all with jokes. Bad jokes.